The gun-metal gray clouds were rolling across the Grand Mesa southeast of Palisade, Colorado. We were just a mile or so from the Upper Colorado River, having just ridden a couple of miles on a riverside trail. Rain was in the wind, and while readying our gear and sheltering the bikes, we walked up to the deck of the tasting room at Red Fox Cellars. While we could see lightning tickling the sky in one direction, the sun painted the golden cliffs of Mount Garfield rising from the back of the vineyards to the north. Red Fox was to be the first stop on the roughly 12-mile weather-threatened ride along the Palisade Fruit and Wine Byway. The tasting room was serving a couple of red wines with full bodies. A couple of bottles went into our backpacks to resettle back in Phoenix. She took a couple of glasses of the Cabernet Sauvignon back to the group. Several other small groups and couples were wandering in. We decided to race the storm to the next winery on the list, Maison La Belle Vie Winery, a little touch of French countryside in a low-slung French farm house style and event and wedding venue. So far we were winning the race, and enjoyed the sweet Muscat they offered. 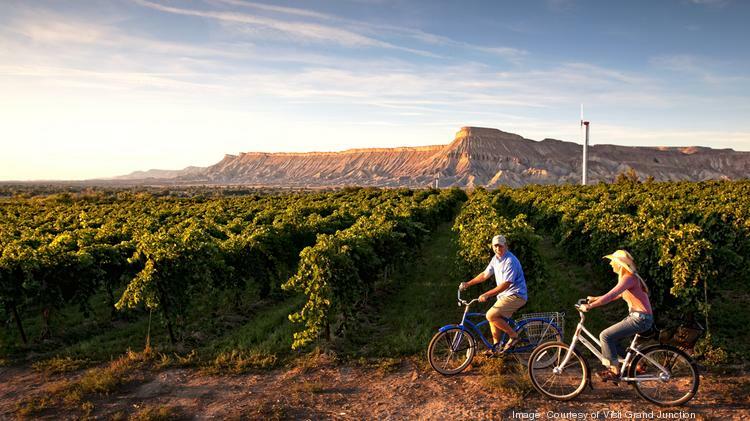 Palisade is the heart of the Grand Junction area’s wine country. The adorably well-trimmed town is a time travel into agricultural areas preserved from another era. Palisade, long-known for its sweet peaches, has been turning into agritourism center with vineyards, distilleries, brewers, orchards and recreation opportunities. We rolled into the quaint low-slung downtown of mid-century brick stores and stopped at Rapid Creek Cycles. Rondo, a refugee from the Midwest, outfitted us on a pair of 27-speed matching Raleigh road bikes, after he initially suggested a pair of hybrid mountain bikes or beach cruisers. Those traditional bikes are the only offering in Palisades. We hit the Colorado Riverfront Trail knowing we were being watched by the brewing thunderstorm over the mesa. The upper Colorado east of Grand Junction is a different river than the one through the Grand Canyon in Arizona. One thing we didn’t and you should, get a bike basket for purchases. The roads are not heavily traveled, except for U.S. 6 — Front Street, the main drag in Palisade. Even so the bike ride never felt crowded by traffic. Most of the wineries are located in a cluster that makes for a easy, level loop, depending on the number of tasting rooms to be visited. Palisade has a map offering routes of five, seven and 25 miles. The various routes take cyclists down rural roads, past farms, orchards and vineyards. There are more than a dozen wineries, a few more fruit orchards and specialty farms, plus a couple of alpaca ranches. There are beds-and-breakfasts and motels. Another place of interest we found is Meadery of the Rockies. Mead is an historic and Middle English wine made with honey, water and fruits. Although not a fan of sweet reds, the unique blends and flavors resulted in another couple of bottles added to the backpacks. The last stop of the day was Peach Street Distillers. We sampled its hand-crafted Colorado Straight Bourbon – smooth as silk – and d’Agave, distilled from blue agave, but cannot be called Tequila, because that drink can only be distilled in Mexico. We spent half the day on our bike tour-wine tastings, which was not enough to visit all of the wineries in the area. That’s the downside of a long road trip, where every other day has its own hefty drive. Doing it again, Palisade is a definite day trip, with a break for lunch or a charcuterie at one of the several wineries serving food or the restaurants downtown, would be an extraordinary excursion. The town does have motels and inns. Palisade is located off I-70 (Exit 42) about 15 miles east of Grand Junction in western Colorado. The community has a detailed map showing locations of wineries, farms, lodging, dining and retail.